Every year, Quench profiles Canadian chefs who are contributing that elusive something to the food scene, helping to change it, helping it to evolve. This year’s lineup is (often unintentionally) helping to define Canadian cuisine, which is no mean feat. Simon Mathys at Manitoba Restaurant in Montreal celebrates Canada’s large forests by bringing nature (and trees and bark) to the plate. Chef Mathys joined the Manitoba Restaurant team in 2016; owners Simon Cantin and Elisabeth Cardin introduced him to the concept of forest-to-plate and transforming Canadian-sourced ingredients into symbolic representations of our country’s large natural ecosystems. Mathys draws on his education at L’École Hôtelière in Laval and his experiences working at St-Christophe with Stéphane Charpentier, at Laurie Raphael with Daniel Vezina and at France’s La Ferme de l’Hospital. 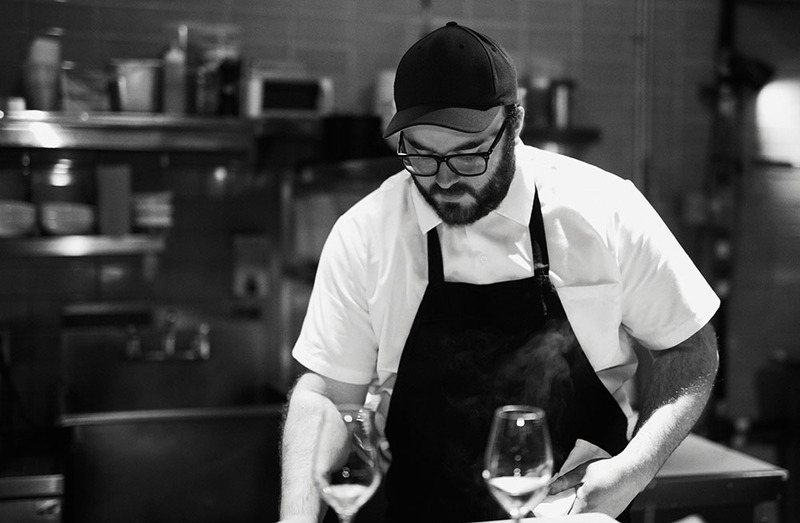 His return to Montreal in 2011 was followed by an increase in his prestige: head chef at Bar et Boeuf followed by a stint as head chef at Racines. Now, he’s redefining the simplicity of eating well, drinking well and having fun with food while also working towards giving Canadian cuisine a leg up on the world’s food scene. How do you bring the forest onto the plate? With the foraged products. By the history of Quebec’s cooking, too. Bringing a little bit back of the memories that we can discover. And with the plating, we play with the different layers of colour and texture. So, we bring different layers, and visually we try to bring back some of those colours. Like, we sell seal for now, so we try to bring back some white element for the snow, kind of play around with where we have the product. Do you forage for ingredients? For both of the owners, it’s an obsession. In the summer, we forage the most. We start on the North Coast, Gaspésie. We move pretty much every weekend to forests — anywhere really. And depending on the season, we bring back anything we can find over there. We also buy a lot from other pickers. All over Quebec. It’s been said that your food evokes memories of hiking and being surrounded by trees. How do you create that? We infuse. Like we’re making chocolate ganache infused with pine. You can really taste the pine but eating pine is not good. It’s not what they eat. For the chocolate, we infuse it with the water. Bring the water to a boil and make the ganache with the water. And it doesn’t contain any dairy so those who are lactose intolerant can eat it. In your opinion, what is Canadian cuisine? It’s all to discover. We don’t have thousands and thousands of years of cooking history, like in Europe. But I think if we can make our own choice… [to] bring some new Quebec cuisine, with all the products and the small history we have, and push it forward. There’s a big history of mixing things, with the British invaders, French invaders, the First Nations here. I mean, the whole cooking history comes from all these people coming in and interacting with the First Nations. So, we try to find these spots or points where these cultures cross together and make our culinary history. I noticed you guys offer some game meats on your menu. Is that also part of the Canadian/Quebec cuisine? Are you allowed to serve wild game in your restaurant? Yes, for sure, it’s part of Canadian/Quebec cuisine. There’s only two [kinds of] wild game that we can serve. It’s the seal and the hare. We have some deer but it’s not wild. It’s like, wild farming — they’re free but they’re on a farm. So, the only game we can serve that’s wild is the seal and the hare in Quebec. Do you think that you should be allowed to serve deer that was caught in the wild? That’s a big debate. I would say no, because it opens up the whole poaching risk. As long as I can buy and sell these, there will be some guys trying to make money over it. I like the idea of: the only way you can taste that meat is having someone who offers it to you or you can go catch it yourself. Otherwise, you can’t buy that here. Is there a special story behind the name of your restaurant — Manitoba — since you’re in Montreal, pretty far from Manitoba? The main idea is we wanted to have a link with the First Nations. So, we wanted the name to be Native American, without bringing back the whole political history with the First Nations. For most Quebecers, Manitoba is just an empty space with bison in it. If we have to bring back the political history of Manitoba, it’s Louis Riel and the Métis. So, [what’s] already embedded in that name is the mixing of these two cultures: the colonial one and the First Nations. And the name sounds good in French and in English, and it looks good graphically. And it’s an easy name to remember. What is the one thing in your kitchen you can’t live without? Salt. It brings out the taste of food. Food without salt is bland … it’s not good. Is there anything that you don’t like about other restaurants that you try to fix here in your cooking or how you work with your team? We try to reduce the waste, for sure. Use more local products to encourage the economy in Quebec. And the schedule for the team. People are working four days a week, so they can have a life doing what they love to do. It’s long hours, working all the time. I try to contain that, make sure that everyone’s happy. They can have a long weekend, three days off to go do what they want. What is your favourite meal when it’s cold and rainy outside? Braised meat. Big pot of braised meat with roots and vegetables, and a big piece of bread. It just has to be good braised meat. In a pan over high heat, sear the seal for 1 minute per side. Set aside on a plate cool. Place the celeriac directly in the flame of a grill on high heat. Burn it all the way around, until soft to the touch. Let cool. Peel the celeriac, then use a Rotato Potato peeler to make a long string. Cut the seal into small cubes and place in a bowl. Add salt and a drop of canola oil. Shake to mix. In a pan, reduce the brown stock by 3/4. Add the elderberries and smoked butter. Stir to make a sauce. Place the seal cubes on a plate. Add the sauce and top with a long celeriac string. Season with fleur de sel.